The first phase of our renovation at Hamilton District Christian High is an exciting test of new ideas. 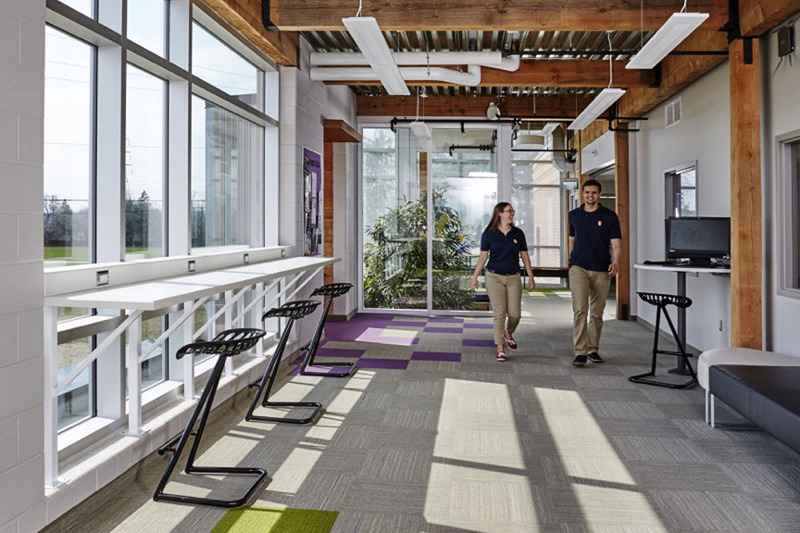 Our design at the high school explores innovative ways for students to interact with the space and with each other, therefore transforming what was a typical high school typology. The hope was to build on ideas pioneered by Prakash Nair’s work, including the interpretation Campfires, Caves and Cafes. 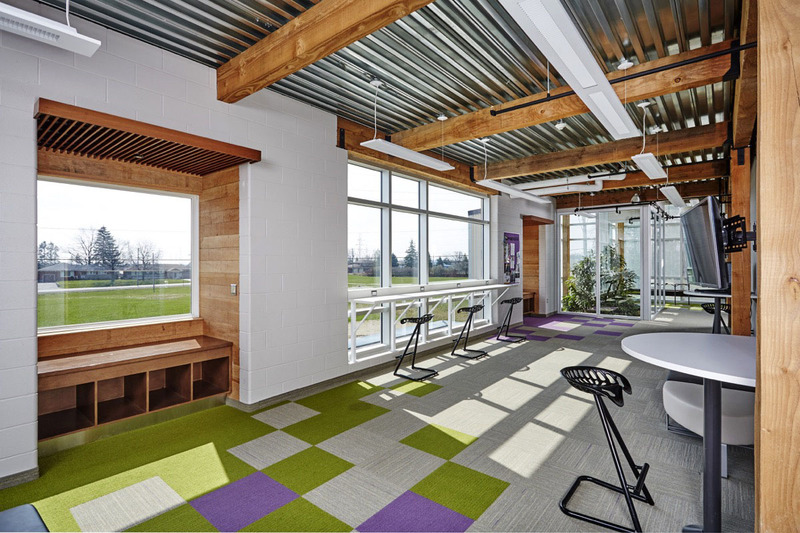 The result – we shaped a Learning Grove downstairs and Learning Atrium upstairs. Each area is filled with light, skylights and natural materials. 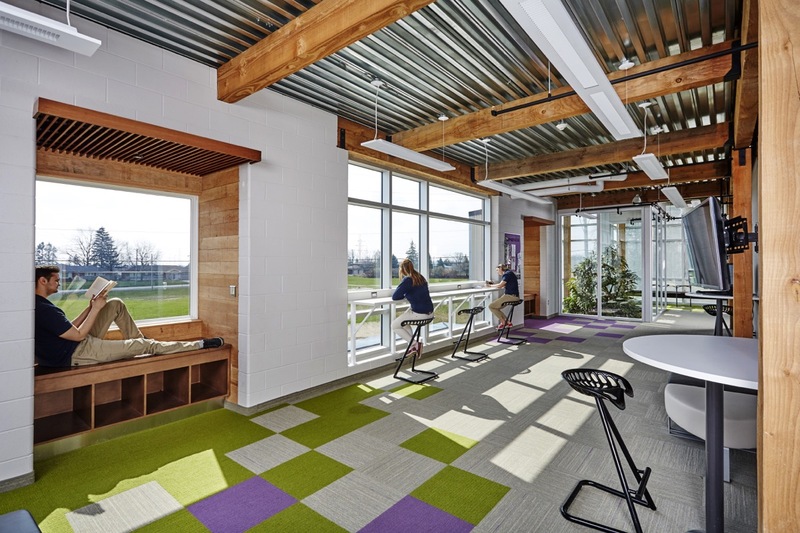 We paid special attention to the acoustics of the space, allowing for natural groups to form and collaborate, while respecting areas for individual study. On the first floor, we incorporated natural materials, married with industrial elements. A long community table acts as a central gathering place. Glazed meeting rooms do not impede the view and still allow small alcoves for private meetings. On the second floor, using many of the same materials, we incorporated more study areas and small nooks that act as quiet study areas. The two floors are bridged by a large, living fig tree. 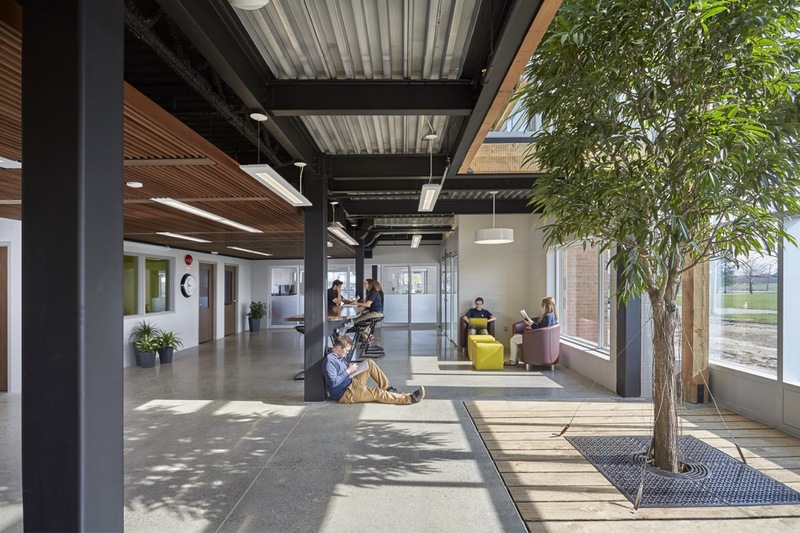 The tree is an important symbol for the school and creates a visual connection between the outdoor and indoor environments. 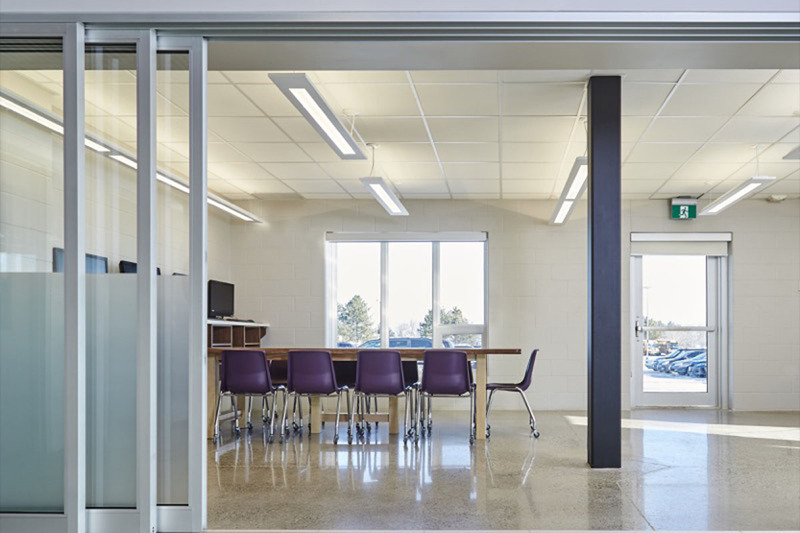 The early success of phase one helped to propel the second phase of the project, including extensive renovations within the school’s atrium and classrooms. 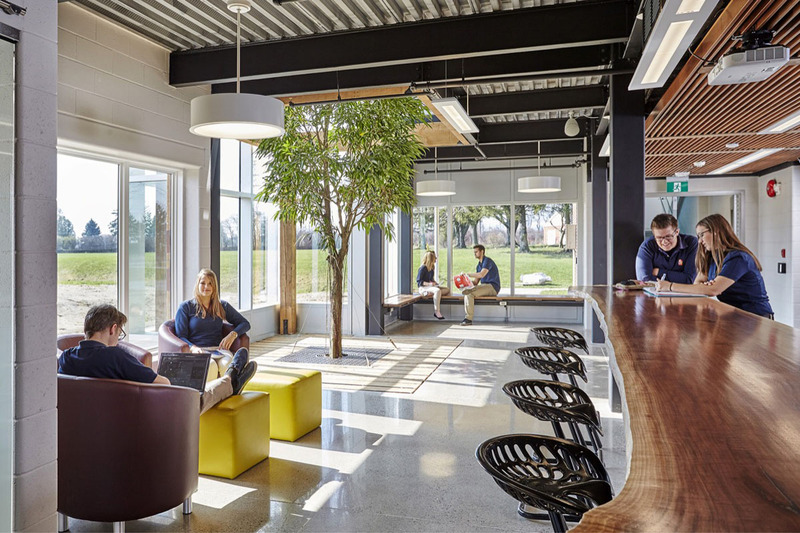 Reshaping a traditional high school typology, creating a new way to think about how students interact with the space and each other. The large community table at the centre of the the first floor has changed the way that students gather. Its design encourages interaction, and as a direct result you can see the barriers between students come down. You can see them interacting in a different way, just because the space has been provided. Visually, the space is open and you can easily scan the entire environment. Teachers can easily breakout with a smaller group of students and work through ideas. Students can tuck into caves for individual study, while groups begin to form around natural collaborative areas.